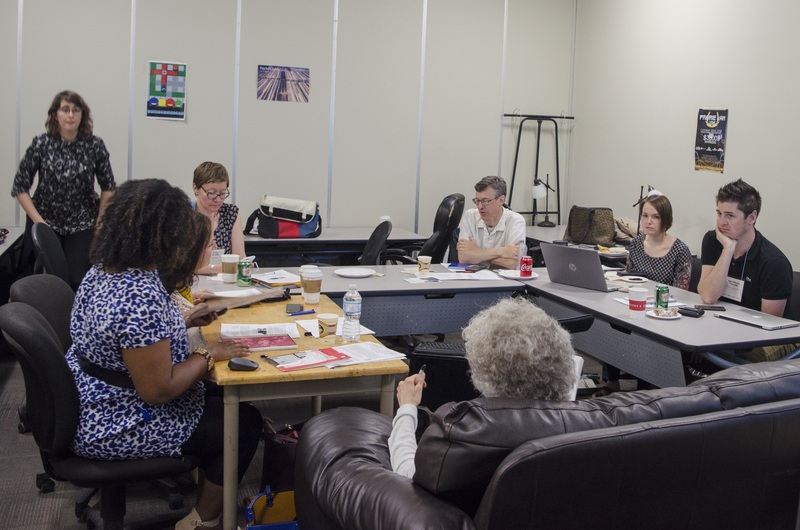 The Canadian Network on Humanitarian History (CNHH) convened its fifth annual workshop during the 2018 Congress of the Humanities and Social Sciences, hosted by the University of Regina. In attendance were Dominique Marshall, Jill Campbell-Miller, Sonya de Laat, Valérie Gorin, Daniel Manulak, Kiera Mitchell (Technical Assistant), Cyrus Sundar Singh, Yordanos Tesfamariam, Jean-Michel Turcotte, and David Webster. Joining the meeting by Skype were Katie-Marie McNeill, Chris Trainor, and Anne-Emmanuelle Birn. After greetings and personal introductions, Valérie Gorin (Media Studies at the University of Geneva) discussed exchanges possibilities for international guests. Valérie noted that there was no comparable network of Swiss humanitarians akin to the CNHH. Around the table from the left, clockwise: Yordanos Tesfamariam from the Multicultural Council of Saskatchewan, Valérie Gorin, Sonya DeLaat, David Webster, Jill Campbell –Miller, Jean-Michel Turcotte, Dominique Marshall. At the back: Kiera Mitchell, technical assistant. Photo credit: Cyrus Sundar Singh. Valérie outlined plans to build a humanitarian encyclopedia which would include common concepts used in humanitarian actions and trace the historical antecedents of these ideas and how they are employed today. This encyclopedia would be both a visual and textual database of humanitarian action. To this end, Valérie is considering organizing an international workshop in 2020. Valérie then reviewed her research interests. She noted that the literature on humanitarian advocacy and its evolution as a form of communication and political activism among humanitarian organizations is rather limited. Three key questions frame her approach. First, how have advocacy and visual strategies evolved? Second, how has advocacy been shaped by professionals and amateurs? Third, how has advocacy been influenced by transnational networks, competing humanitarian networks, and the professionalization of communication. In the ensuing discussion, recommendations were proffered, such as writing an application for funding to the Cooperative for Assistance and Relief Everywhere (CARE), and possible collaborations with the National Film Board of Canada and the History of International Organizations based in Geneva. Dominique (Professor of History at Carleton University) and Chris (Archives and Research Collections at Carleton University)—who joined the meeting by Skype—spoke about their work with the Archival Research Project which collects humanitarian material. Chris noted that this collection includes material donated by past directors of Oxfam—like Meyer Brownstone and John Foster—and is complemented by an oral history project. To take one example, these archives contain documents from Mike Malloy regarding the Ugandan Refugees Collection. Dominique commented that one central goal of the Archival Research Project is to have it used as a tool by students. The scope of the project was compared to the Bodleian at the University of Oxford, which houses the Oxfam files. Discussion revolved around how many archives in Canada do not appear overly interested in acquiring NGO papers and how NGOs in Canada often do not maintain archival collections. David Webster, Professor of History at Bishop’s University, described a project he is working on to preserve and digitize Canadian NGO archives. This would serve both as a teaching resource and for publications. Conceptually, the database would be modeled after the National Security Archive at George Washington University and the Cold War International History Project. As David explained, the idea is to document twentieth century international relations in a way as to make visible material that is not readily available or, often acquired, by national archives. Each documentary collection would be accompanied by an electronic briefing book—or an e-dossier—designed to situate the material in its historical context for researchers and students. A similar project is being organized by Tim Sayle and the Bill Graham Centre for Contemporary International History at the University of Toronto. A key difference between David’s plan and the Bill Graham Centre’s is that the latter places more emphasis on interstate relations as opposed to non-state actors. The discussion revolved around how to digitize and store the archival collections, and how NGOs and individuals could make their collections available to the project technically. Anne-Emmanuelle Birn, Professor of Critical Development Studies and Global Health at the University of Toronto, described a project for a special issue of the Journal of Canadian Studies/Revue d’études canadiennes on critical perspectives on Canadian humanitarian initiatives in the international domain (via Skype). Anne-Emmanuelle noted that the Journal of Canadian Studies is investigating how, historically, humanitarianism intersected with international and global health. Those interested are invited to submit an abstract by July 15, 2018. In the ensuing discussion, Anne-Emmanuelle mentioned that the special edition could be expanded thematically to humanitarianism and development more broadly. Anne-Emmanuelle emphasized that the Journal of Canadian Studies is accepting papers that contend with both state and non-state actors. Some themes that were offered for consideration centred around gender, caring, and the visual. The group also deliberated on what would be the best format to proceed for this project. 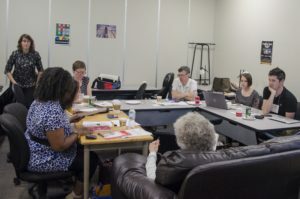 The possibilities included a special issue, a connection grant that would facilitate a workshop in the autumn of 2018, or an edited collection. All three options have their advantages and shortcomings. The attendees agreed to continue discussing this issue in the future. Wednesday dinner. From left to right: JM Turcotte, D. Manulak, K. Bruschett, D. Webster, V. Goring, C. Sundar Singh, J. Campbell-Miller, D. Marshall, K. Mitchell, S. Künkel, S. DeLaat. Photo credit: Cyrus Sundar Singh. Sonya DeLaat is a postdoctoral fellow in Humanitarian Health Ethics with the Humanitarian Health Ethics Research Group at McMaster University. The talks turned around possibilities to wrapping up her own project with the CNHH and to propose a common virtual exhibit on photographs of refugees. First, Sonya introduced her project and presented the website portal with the different information we can find on. The website contains visual material provided by several photographers who acted on humanitarian scenes, links to NGOs, external online resources and other organizations linked to the project. The web page also served to put forward several definitions and categories of “Refugees”, with case examples supported by photos. The project not only concerns photos of refugees as visual representation, but also stories behind the pictures. Second, Sonya’s project is presented as a collaborative work. In this perspective, discussions were about the possibility to link it with the webpage of David Webster’s project. This cooperation could eventually serve as proof of collaboration, an argument for further founding. Finally, as closing remarks, we discussed about the general impression on the project, in particular the webpage and some suggestions to improve it. The comments were very positive. Katie-Marie McNeill is a PhD candidate in history at Queen’s University. Her PhD research explores prisoner aid societies, such as the Elizabeth Fry and John Howard Societies, in the 20th century across Canada, New Zealand, Australia, and the United States. She presented the project North American Cultural Diplomacy Initiative, which is a multidisciplinary partnership that includes academics, policymakers and practitioners from North America and beyond working on humanitarianism and art history. Katie-Marie is a collaborator in this project, as a research assistant. She gave a general presentation of the project, explored the webpage explained the different collaborators and the network and mentioned the next events related to this project. Discussions were about the links between the project and other international humanitarian organizations/researchers, especially those using of images or visual representations. As examples, the project of Valerie Gorin seemed relevant and D. Marshall proposed to Kathy-Marie to joint the talk of Prof. Jessica Gienow-Hecht at Carleton University next September, who is working on cultural diplomacy. Cyrus Sundar Singh, PhD candidate in Communications and Culture, talked about filmmaking, art and the history of aid and development. Describing himself as a musician, poet, storyteller filmmaker and an Academicreative scholar, Cyrus presented his recent project: Floating to the Lure of the Promised Land: A Condition of Displacement. The project concerns the impacts of the civil war in Sri Lanka on the Tamil population. Using multimedia and first person testimonies, Cyrus explores commemoration and displacement as weapons in the continuing subjugation of the Tamils in the post-conflict era. After the introduction, the presentation turned to a co-creative and collaborative multimedia activity. Using a film support, produced by Cyrus, and the contribution of every person present in the room, Cyrus proposed that we read a text moving through the journey of displaced persons from camp in Sri Lanka to Canada on refuge Lifeboat in 1986, the vigil of mothers of Disappeared people and some scenes on trains, planes and scooters. The discussions closed with a concern on the actual situation in Sri Lanka and some comments on the use of visual/multimedia support by different projects on the history of humanitarianism. First Nations University of Canada on the campus of the University of Regina. Photo credit: Cyrus Sundar Singh. Yordanos Tesfamariam works for Multicultural Council of Saskatchewan, and formerly of Women of Africa in Regina. In the commemoration of the 40th anniversary of the organization, Yordanos made a general presentation on the origin, aims, structure and former and actual projects and activities organized or sponsor by the MCOS. 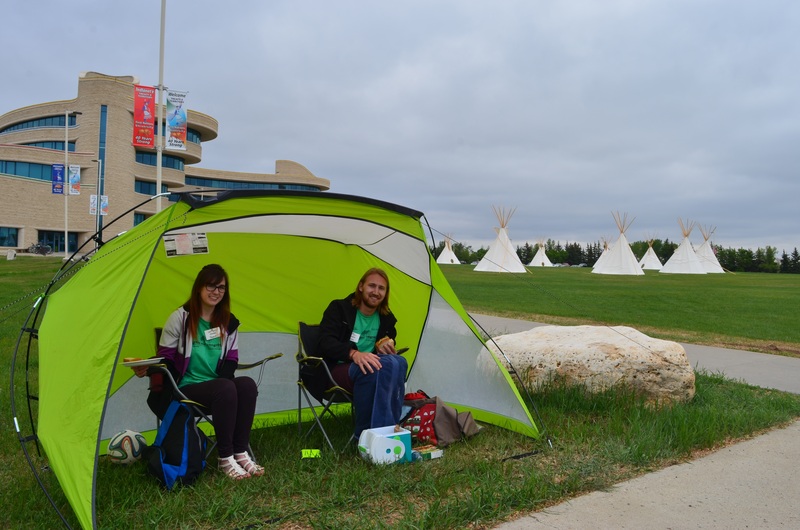 She presented and defined the communal building process and cultural community in Saskatchewan supported by the MCOS. Through different multicultural activities and supports, the organization tries to facilitate integration and assure a cultural continuity for immigrants. Intercultural connections, celebrations of diversity, recognition and rejection of racism are some principles promoted by the MCOS. Yordanos circulated pictures from the different intercultural activities organized by the MCOS in the last decades. Thereafter, the discussion was about how to handle this material in an archival perspective. Proposition was made to digitalize the pictures (and the archives of the organization) and link the material with other projects of the CNHH members: i.e. David Webster, Chris Trainor and Dominique Marshall’s. This proposition will need further discussion and contact in the future. No major closing remarks – grateful thanks from Prof. Marshall – End of the meeting. Daniel Manulak is a PhD Candidate at Western University. His dissertation is on Canada and South African Apartheid, 1984-1994: Race, Identity, and Foreign Relations. Jean-Michel Turcotte is a Postdoctoral Researcher at the John F. Kennedy Institute for North American Studies at the Freie Universitaet Berlin. His research interests include war captivity, international humanitarian law, Western diplomatic history, and the history of international relations.